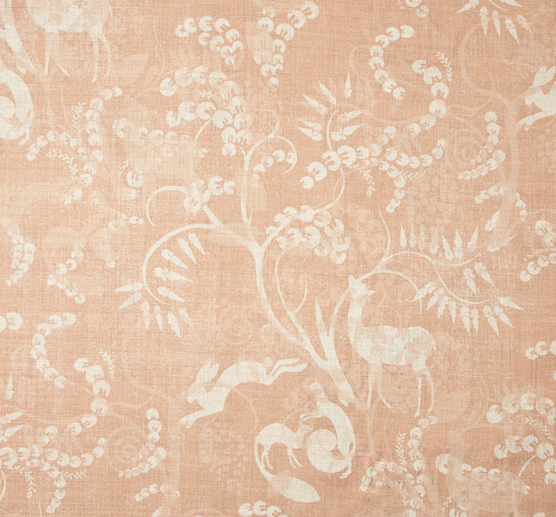 Back in May, textile designer Lisa Fine shared with us the story behind her Malula linen, which was inspired by stylized ferns in Albert-Armand Rateau's art deco murals and the famous Lanvin bedroom in Paris but named for her dear departed, high-strung Wheaten Terrier, Malula (a dog known for running in circles like the ferns in the print). Lisa also mentioned her affinity for deer -- creatures featured in Rateau's work -- and explained that a more-challenging-to-produce companion print with animals was in the works. 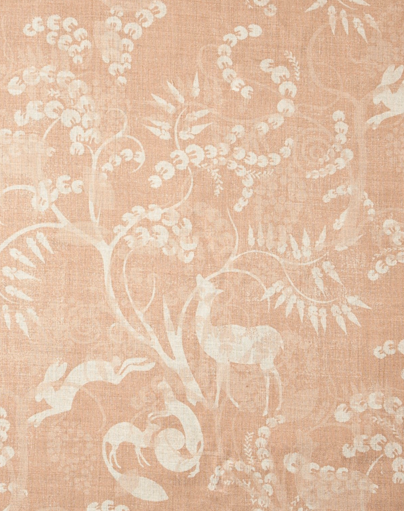 Now you can see the beautiful linen, Pandora, online. Carolina Irving's textile site has been updated, too. 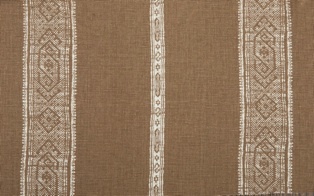 Patmos Stripe Reverse can currently be viewed in six different colors. And in Atlanta, the holiday gift wrap selections are in stock at Anthropologie. Refreshingly, the store isn't yet completely decked out; it still feels like autumn, not a winter wonderland. But for those who enjoy gathering supplies on the early end, or just have fun brainstorming, the offerings are available. Wonderful textiles! I can fully understand the passion for these kinds of motifs and the colours are so lovely. What a great post. Although, I must say, "I, too had a Wheaton Terrier, that was and will always be a part of my life and still lives on within my heart...Yes, indeed she had a mind of her own. Yet, they do say dog's take on their owners likeness. Jessie, was sweet, kind and knew what she wanted from this world and what she was able to give back...Oh, how she did give back. Sixteen years of happiness to me and all those who met her. I simply adore the wallpaper. She is a superbly talented artist. The colours are simply stunning. I think my Jessie AKA The Wheaton Terrier...Would love to know that I am honouring her with the most beautiful wallpaper. Every time, I look at it I will think...How beautiful this paper is... as well as my Terrier. What an honor to visit your site this evening!! ~m. Courtney, I adore the hammered gold mesh!! Would love to use it in many artful ways! Love her fabrics - they have that timeless, historically referenced quality, yet are modern at the same time - so versatile. And the gold mesh paper is fabulous!! The linens you chose are just beautiful. What perfect shades too. Thanks for all the links. So happy you were able to sense the beauty from these digital images. Quintessence, you nailed it -- both Lisa and Carolina really do the historically referenced thing well, keeping their fabrics so fresh at the same time. Thanks for sharing your story. It's funny how certain posts trigger memories.